Auburn Hills, MI - When it came time to redesign the all-new 2005 Jeep® Grand Cherokee, keeping what customers love about the vehicle and breaking new ground to improve its design was a delicate balance. With its upright and substantial posture, the 2005 Jeep Grand Cherokee’s new design offers an athletic and contemporary appearance. The new exterior design has a higher belt line and a reduced glass-to-body proportion. Signature features of the vehicle remain, such as the seven-slot grille which boldly dominates the front view. 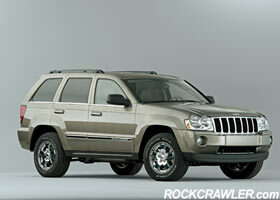 The Grand Cherokee Laredo will feature a painted body color grille, while a chrome-plated grille will accent the Limited. High-performance halogen headlamps employ a rounded traditional Jeep appearance and gracefully integrate into a powerful hood form. The hood features sophisticated nacelles – hood forms that protect and shelter the headlamps. The hood, air dam and exterior mirrors were developed in the Chrysler Group’s wind tunnel in Auburn Hills, MI, to minimize wind noise and maximize aerodynamics. The shape of the body has been thoughtfully designed to protect the sides of the vehicle from potential road debris thrown off the tires. The heavy and expensive cladding used on the previous model is replaced with a more efficient body-side shape and moldings that are incorporated into the design. 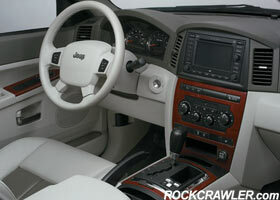 The body-side molding also has the integrated Grand Cherokee name for a quality look and feel. At the side, a proportionately longer hood and greater distance between the center of the front axle and base of windshield visually communicates more engine emphasis to achieve a more powerful image. At the rear, larger taillamps feature red and clear lenses for a look that presents a luxurious feel without being gaudy. Badges are now injection-molded and chrome-plated to communicate a richness and sense of precision. The 2005 Jeep Grand Cherokee takes capability and refinement to new levels, proving there’s no reason a capable vehicle can’t be comfortable and polished. A new and inviting interior awaits occupants with a rich two-tone instrument panel treatment, new door trims and upscale interior finishes. The seats are beautifully crafted with contours that are precise, firm and ergonomic, featuring a new robust structure. They are purpose-built and designed for long-distance comfort with trim styles different for each model: Laredo features cloth and optional leather while Limited seats are two-tone leather with perforated leather seat inserts. The dramatic and elegant instrument panel design offers a high degree of precision. The instrument panel features a dark upper color and lighter lower color. Multiple storage bins have been added for additional storage. A new precise four-gauge instrument cluster with LED illumination features black gauges surrounded with red pointers, for reading ease in all lighting conditions. On the Limited model, the gauges are surrounded by chrome accent rings. In the cargo area, versatility and storage reign. A new reversible load floor panel is carpeted on one side and offers easy-to-clean plastic on the other. The plastic side includes a large shallow tray for additional utility.